Available in a natural or sawn top and bottom. Natural stone steps can be made to any size or specification. Finishes include a natural, flamed, sandblasted, honed or chiselled surface. Looking to make a change on the look of the entry to your home? 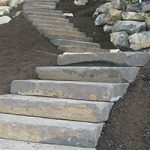 Natural stone steps and risers are available in a natural or sawn top and bottom. Included in the finishes is a natural, flamed, sandblasted, honed or chiseled surface. Natural stone steps are created to your specification as well as any size. 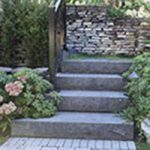 Hardy island granite steps are also available in the natural or sawn top and bottom. The finishes are flamed or sandblasted top with your choice of flamed, chiseled or sandblasted face. 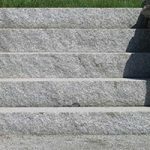 The thickness of the Hardy island granite steps and risers come in a thickness of 1.25 inches or thicker. The lengths they come in are 12 inches to 120 inches with widths made to your specifications. The varying weight of this product starts at 2 inches equaling 26 pounds per square foot, 3.5 inches equaling 50 pounds per square foot, 6 inches equaling 80 pounds per square foot, and 7 inches equaling 100 pounds per square foot. 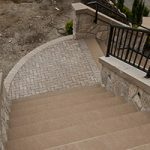 Hardy island granite steps and granite blocks are a beautiful addition for any of your steps and riser needs. 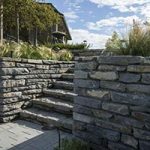 Whistler basalt steps are a landscaping stone step available with a natural weathered face. They also are available in a split (natural) top or sawn bottom in random shapes and sizes. A sandblasted finish provides a nonslip surface. 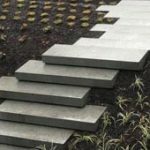 Whistler basalt steps are easy to install coming in a width of 18 inches to 30 inches, a length of 18 inches to 30 inches with a thickness of 5 inches to 27 inches making these steps a beautiful addition to your entryway. Blacktusk basalt steps have a flamed top with an option of a chiseled, flamed, or natural weathered face. These beautiful steps come in a width of up to 24 inches and a length of 12 inches to 120 inches and have a thickness of 2 inches to 12 inches. The weight of these vary from 2 inches equaling 31.6 pounds per square foot to 3.5 inches equaling 47.4 pounds per square foot, 6 inches equaling 94.8 pounds per square foot, and 7 inches equaling 110.6 pounds per square foot. Black tusk basalt steps and risers enhance any garden space, entryway, or as a walkway to another area. 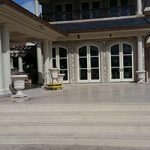 Country estate limestone steps have a finish which includes a sandblasted or honed top with your choice of a chiseled, sandblasted or flamed face. Country estate limestone steps have a sawn top and bottom. The width is to your specifications and the length starts at 12 inches and goes to 120 inches. Its thickness comes in 2 inches, 3.5 inches, 6 inches, and 7 inches. Country estate limestone steps will always look elegant and provide an elegant touch to your entry design. In any environment country estate limestone steps accent the already beautiful surroundings. Vieira limestone is a natural stone step with a sawn top and bottom. Its finishes include a sandblasted or honed top with a choice of a chiseled, sandblasted or honed face. Its width is to your specifications and its length starts at 12 inches and goes to 120 inches. The thickness of the Vieira limestone comes in 2 inches, 3.5 inches, 6 inches, and 7 inches. 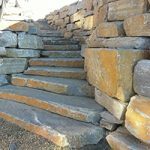 The weight of these stone steps comes in 2 inches equaling 31.6 pounds per square foot, 3.5 inches equaling 47.4 pounds per square foot, 6 inches equaling 94.8 pounds per square foot, and 7 inches equaling 110.06 pounds per square foot. This durable stone step enhances any entranceway or stairway area.